Ever stopped to think about poo? As an archaeologist, I find myself constantly dealing with waste. Waste comes in many forms, for example discarded flint, broken pottery, smashed glassware and half-eaten food remains. Studying ancient rubbish, contrary to how it sounds, is actually quite useful because it can tell us what ate, what they ate off, what they ate with, how they lived, how they died, what their belief systems were and so on. 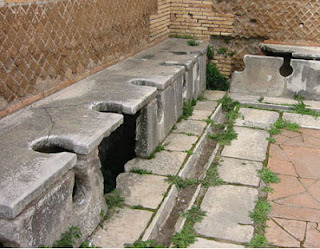 Unfortunately, one type of human waste product is rarely considered by archaeologists or historians: excrement. Perhaps this is because of the taboos that surround discussion of what is, apart from the desire to mate, one of the most basic of human activities. Perhaps it is due to an almost Victorian-style desire to suppress any thought of poo. Perhaps it is the very words used to describe the act of defecation that are the problem (it is usually impossible to mention words such as poo, poop, crap, turd, do-do, dump or number twos, without an accompanying ‘Sid James-style’ guffaw). As a consequence, excrement is often not treated as a subject worthy of serious study. This is a shame because the act of defecation is one that, together with birth, eating, drinking, reproducing, breathing and death, links all life on earth. Everyone defecates. Everyone in history (even Queen Victoria) has defecated. Though we may not choose to acknowledge the fact, pooing is important. Our stools could, for example, help those in the future understand how healthy we really were. Where we poo, the taboos that surround the act of pooing, the architecture that we construct to hide those engaged in the act of defecation and the multitude of ways in which we dispose of the end product, can tell us more about the state of society than any book, newspaper or other historical document. Archaeologists, historians and other guardians of our past are, however, often unwilling to discuss such basic human functions, preferring instead to grapple with seemingly weightier topics such as “peer-polity interaction spheres” or “sociopolitical geographies” (Archaeospeak). These are, incidentally, exactly the same topics that visitors to an ancient monument or listed building are NOT all that keen to find out about. Why be told about the infrastructure of Roman civil administration when you can find out how Roman soldiers wiped their behinds (with sponges soaked in dilute vinegar so we are often told, though the consequences of such an action on a private place do not really bear thinking about)? 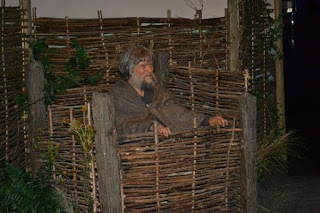 or the human coprolite displayed in all its glory, both at the Yorvik Viking Centre at York? 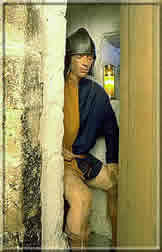 What about the medieval sentry cheerily defecating in a corner of Castle Rushen in Castletown on the Isle of Man? Few recreations of the early medieval period are so evocative as these. I am told that the York and Castletown displays are the most popular (they are certainly the most memorable) aspects of each of these visitor attractions. 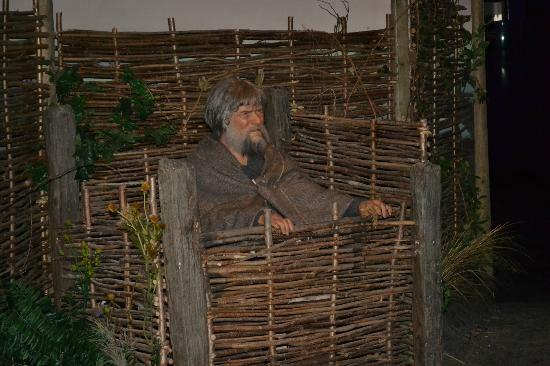 Discovery of apparently primitive toilet facilities in an ancient monument or listed building can help to reassure us that “things are certainly better now” than they ever were in the past. Beyond the novelty value, however, such places provide a more tangible link with the past (or passed). The acknowledgement that everyone in history defecated somehow makes these people seem more real. More human even. Cleopatra may have been the Siren of the Nile, but she defecated just like everyone else. Alexander the Great was driven, every morning, by a natural force greater than his desire to conquer the known world. The act of defecation links the past to the present perhaps more strongly than any other human activity. People in the past may have believed different things, worshipped different gods, worn different clothes, spoken different languages, but they all pooed. Just like us. I once found a potentially prehistoric poo and it was a monster. Perfectly preserved in every detail found in a pit at a settlement in the Outer Hebrides. Now I don't know anyone else's toilet experiences, but sometimes when sitting on the loo when you really need to go, you have this poo slowly squeeze its way out of your backside, hardly making a sound as it enters the water. Then after wiping, you stand up and as your reach to the flush you see staring back up at you from the bowl, an almighty turd, half raised out of the water and you think 'I can't believe that huge thing came out of my backside!'. Well it was one of those that I found. 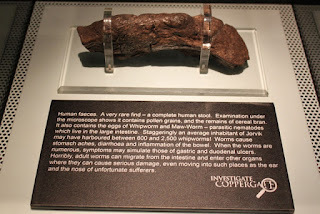 This monster turd got a finds tray all to its self with its own labels "Human Coprolite", it was also duly noted on the context sheet. The finds supervisor came round, collecting the various trays of finds, she certainly wasn't excited about this find, repulsed or disgusted might be better ways of describing her feelings. As she carried the turd away, the finds tray was held as far away as possible by only the tips of her fingers. 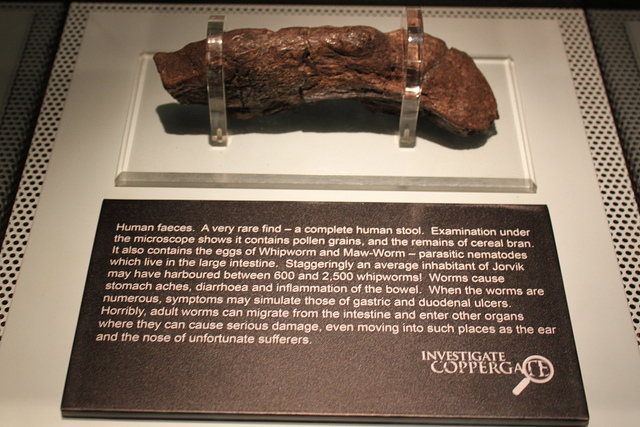 That was the last time I saw that turd, it then mysteriously disappeared, which really pisses me off - that poo could have potential - it could give us real insight to what that person was eating a couple of thousand years ago, but some peoples attitudes seem to get in the way. It's not dirty, it's not smelly, its nicely dried out - almost like a weird fossil, its hardly like I've just had dump in the trench and stuck the results in a finds tray. Thanks for sharing your 'toilet experiences' - for the record, I think it's worse when the aforementioned 'monster' speedily escapes through the modern plumbing system, thus depriving you of the opportunity to come face-to-face with your foe....anyway, I digress....I suspect, given your comments on the finds supervisor’s reaction to your special find, that she probably did suspect that someone had freshly passed the deposit into the finds tray and therefore discarded it ‘appropriately’. If so, that was a shame, for toilets, and human waste in general, are rare from any archaeological site and are things which, at the very least, could (as you note) better inform us of an individual’s eating habits (not to say digestive health). Their overall significance can be demonstrated by the prize-position held in Yorvik Museum by the ‘Viking-poo’, a find which is (I believe) a major tourist draw (especially for Schools). Anyway, good luck in any future archaeo-dump gathering exercise!